You know when your mind is all set for something, only to realise that whatever you've intended won't be fulfilled? Yes, a good word would have been, 'Disappointment'. But can you imagined the chaos that ensued, due to sibeh last-minute plan-changing? My colleague the driver was like, "So now what??! Where? Where to go???!" He went berserk and didn't even stop the vehicle by the roadside to wait for an answer when he asked that. He. just. kept. on. driving!! So he drove along Joo Chiat Road. We girls were like, "Shall we eat here…? How about here…? Here! Stop here…!!" This fella somehow knew where he DIDN'T want to dine at, yet he can't figure out where he really wanted to. And he dare say that we ladies can never make-up our mind… Pfft. Then we passed the Evertop eating place and I was shrieking at him, "Let's eat here! The duck! I want to eat the duck! I miss the duck!!!" (yes, the duck was all I think about so you might be forgiven if you've thought me to be pregnant and crazing craving). Somehow my colleague eventually agreed. I think he missed eating their food too. We've always ordered from Evertop when they were still around at that air-conditioned foodcourt at the ground level of Geylang Serai market. The only pet-peeve was just how far the public carpark is (no, those congested parallel lots don't count). On that hot & humid day after the long walk from the carpark… we eventually settled ourselves at the entrance of the indoor dining area, sitting right below the air-curtain. I tell you, that blast of fast-moving cold air? Trumps the air-con- anytime. All of us subconsciously ordered something iced and 'lime-y'. 2 of us had the 'Teh-O Limau Ais', another had the 'Sirap Limau Ais' and I had the 'Limau Ais' ('limau' here, refers to the calamansi lime). Just to up the 'refreshing' factor. Mr colleague requested for the 'Malay-style' Mee Goreng. We didn't know there are different variations, until the server asked. However, funnily enough, the same server came by and mentioned something about the 'Malay-style' Mee Goreng being unavailable (seriously… huh??) and asked my colleague if he don't mind settling for the 'Chinese-style' version. Mr colleague was right then, hooked on his Candy Crush game and simply nodded his head. 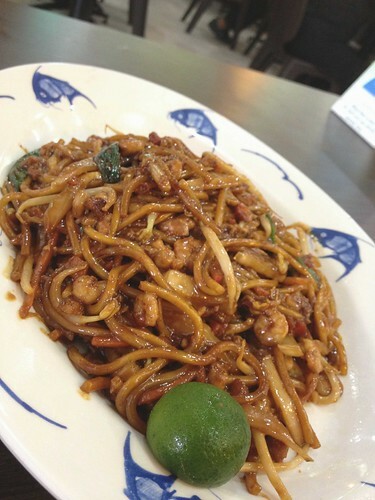 Only after his third scoop did he ask, "How come the Mee Goreng taste a lot like the Chinese one…?" All of us glared and reminded him what he nodded his head at, just now. He was disappointed, actually. 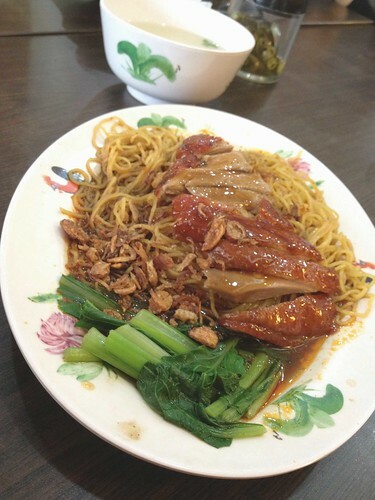 "I miss eating the Malay Mee Goreng, le…"
Another colleague had this, also simply known as 'Crispy Noodle'. She remarked that it was pretty nice, actually. I can't recall when I actually stopped ordering this. 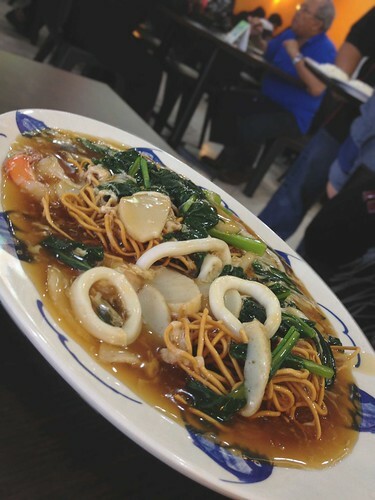 Used to order this everytime I'm at a 'Zhi Char' place. Maybe when I realise for the umpteenth time that the noodles were great only when crispy. When soggy it just… sucked. I naturally just had to get the duck. It's either this or the duck porridge. But I eventually settled for this, although I kinda' miss those slivers of ginger in soy sauce that comes with the porridge. Another colleague of mine- also a duck fan, had this too. Condiments like soy sauce, pickled green chillies and 'chicken rice' garlic-ginger-chilli were available free-flow in containers on every table. I helped myself to the fiery chicken rice chilli, for me to dip those strips of duck breast meat into. Such oomph!! It wasn't pictured because we were busy eating, but I also ordered a plate of ten cute little fried wantans… Which were such 'umami' goodness when eaten with the dark soy sauce that they came with.